Should I Be Worried That My Unborn Baby Has Hydronephrosis? With many pregnant women routinely getting ultrasounds, their fetuses are more frequently being diagnosed with a condition known as hydronephrosis. That literally translates to “water on the kidneys,” but it refers to a dilation of the kidney. This is actually quite common, occuring in as many as 5% of all pregnancies.1,2 If you’ve been told your baby has hydronephrosis, you probably have many questions: What does that mean? Is it serious? Should I be worried? Let’s start with the basics. All of us should have two kidneys and a ureter or tube coming from each kidney to the bladder. The kidneys filter toxins from our blood, and produce urine, which travel through the ureters to the bladder. When we urinate, the urine travels from the bladder through the urethra and out of our body. Even your baby inside of you makes urine, which is what makes up most of the amniotic fluid your baby is floating in. There are many reasons why the kidneys may be dilated in a fetus, but as many as 64-94% of fetuses who have hydronephrosis will NOT have any significant urological problems after they are born.2 In these patients, the hydronephrosis resolves on follow-up studies or becomes clinically insignificant. For these infants, the hydronephrosis is termed idiopathic, meaning there is no cause identified for it. Ureteropelvic junction (UPJ) obstruction: a complete or partial blockage of urine at the point where the ureter exits the kidney. Posterior urethral valves: tiny valves with very small openings in the urethra. Vesicoureteral reflux: the abnormal, backwards flow of urine from the bladder up the ureters towards and sometimes into the kidney. Megaureter: a large, dilated ureter that does not function properly and therefore doesn’t drain the kidney as it should. Duplicating collecting system: two ureters draining a single kidney, and this is often associated with a ureterocele or thin-walled ballooning of the ureter as it enters the bladder. These and other obstructions can cause hydronephrosis, and if severe enough, can lead to kidney damage or failure, which is why it is important to identify and monitor hydronephrosis in fetuses and infants. If one of these causes is identified, it will need to be treated. For the patients who have hydronephrosis but don’t have an identifiable reason for it, the severity of the condition determines the prognosis. As mentioned above, measuring the APD is how hydronephrosis is defined, and the larger the diameter, the more severe the hydronephrosis is considered. But there is another way to measure the severity of hydronephrosis, and that is by a grading system designed by the Society for Fetal Urology (SFU) based on the ultrasound appearance of the kidneys. Normal kidneys get an SFU grade of 0, and hydronephrotic kidneys are graded 1-4, with the most severe at Grade 4. Several studies have demonstrated that the higher the APD (the larger the dilation of the kidney) and the higher the SFU grade (the more severe the hydronephrosis), then the worse the prognosis. Remember, in most cases, the hydronephrosis will simply resolve, and there will be no treatment, and your infant will experience nothing worse than an ultrasound or two. But in some cases, an antibiotic is prescribed to prevent urinary tract infections. And in some cases of urinary obstruction, you may be referred to a pediatric urologist and surgery may be needed. In summary, most cases (as many as 94%) of hydronephrosis identified in fetuses will result in no significant urological problem. Prognosis is determined by the size and severity of the dilation: the more dilated the kidney and the more severe the hydronephrosis, the more likely it is to result in post-natal problems. 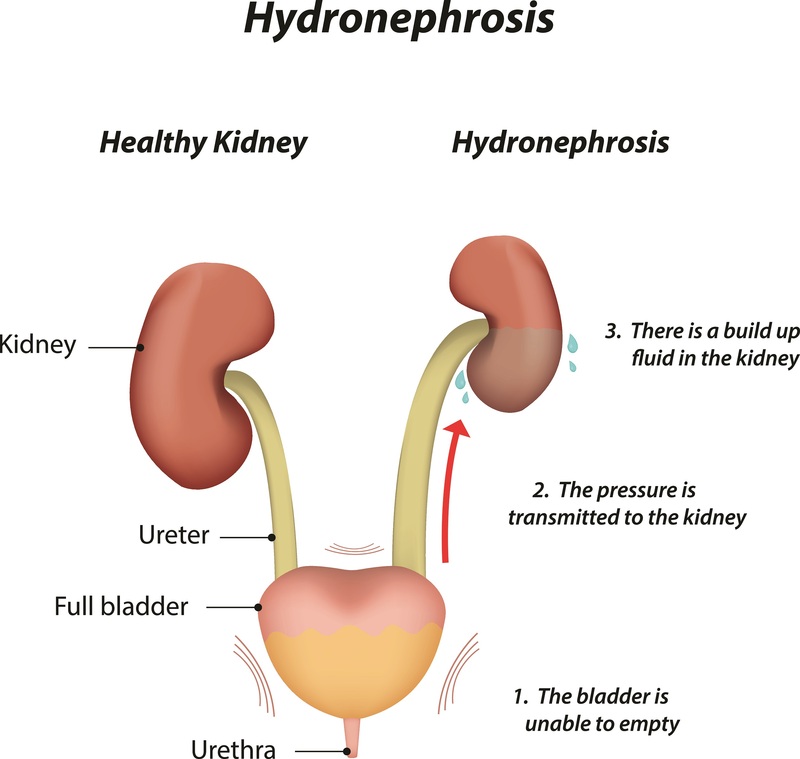 Some infants with hydronephrosis are followed by urologists. And a minority of patients will require some treatment, including medicine or surgery. Urine Blockage in Newborns from the National Institute of Diabetes and Digestive and Kidney Diseases. Pediatric Hydronephrosis from the Children’s National Health System. Sarhan, OM. et al. “Prenatally Detected, Unilateral, High-Grade Hydronephrosis: Can We Predict the Natural History?” Canadian Urological Association Journal 12.3 (2018): E137–E141. Liu, DB, Armstrong, WR, Maisels, M. “Hydronephrosis.” Clinics in Perinatology 41.3(2014): 661-678. Djahangirian, O, et al. “Safe Discharge Parameters for Patients With Isolated Antenatal Hydronephrosis.” Journal of Pediatric Urology (2018, May 16), Epub ahead of print.